In synthetic biology, modeling can be applied to a wide range of topics, for example modeling of genetic circuits. In this subfield of mathematical and computational biology, ordinary differential equations (ODEs) are used to describe the transcriptional and translational processes over time, predict the behavior of the desired circuit and also to support their further development such as optimizing for a desired output, if enough data is available (Chen et al., 1999). 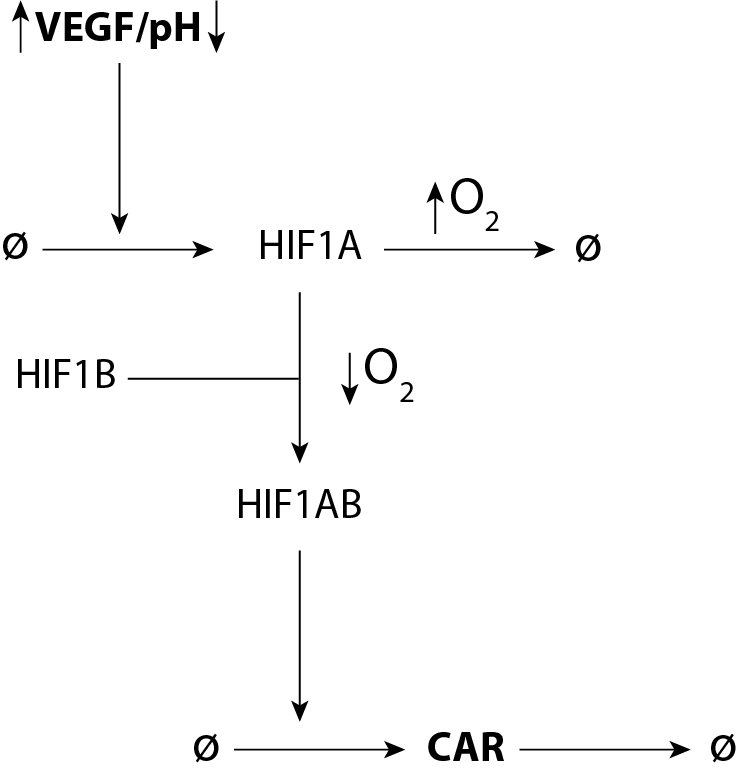 The hypoxia response element (HRE), cAMP response element (CRE) and CTLA4 promoter can be utilized for a more specific CAR expression (Fig. 1). Combining these three enhancers in an AND gate to allow a specific CAR expression (Brophy et al., 2014) proved to be quite challenging. Using endogenous systems came with a drawback - a knockout or knockdown of either HIF1, VEGFR-2 or TDAG8 had to be generated. Generating a single knockout or knockdown is challenging enough but generating three to test all possibilities seemed quite impossible in six months. Therefore using modeling to find the best combination of enhancers and knockout was an attractive option instead of choosing a random AND gate design. To create such a model, the changing concentration of CAR can be described with a system of coupled ODEs. For each component of the genetic circuit - proteins and mRNAs - rate equations describing its synthesis, degradation, association or other processes are added (Chen et al., 1999). Below, it is shown how these ODEs can be set up in their simplest form. The variables are functions of time t, where f(t) describes the mRNA concentration, a(z) the transcription function, k1 the mRNA degradation rate, y(t) the protein concentration, k2 translation rate and k3 protein degradation rate. This kind of ODEs can be solved via numerical integration to describe changing protein and mRNA levels. To obtain the rate constants, experimental data have to be produced which is suitable for a nonlinear regression (Ingalls et al., 2012). Equations (1) and (2) were further simplified for the AND gate comparison into equation (3) by neglecting the mRNA level because the delay of protein expression is not relevant for this model. The variables are functions of time t, where x(t) describes the protein concentration over time, k4 the basal expression rate, k5 the maximum expression rate, b(t) the activation function and k6 the degradation rate. Regarding our intention to raise the specificity of cell killing, different possible designs were conceivable. These are accompanied by the introduction of certain genes or their elimination through a knockout. Focusing on the controlled CAR expression, an AND gate with a clear defined allocation of inputs and output had to be generated. The first possible system was a knockout of HIF1A or HIF1B and its reintroduction via lentiviral transduction under the control of either CRE or CTLA4 promoter. Considering the law of mass action, a knockout of HIF1B would have a kinetic disadvantage over a knockout of HIF1A because HIF1B is accumulated permanently and independently from external conditions (Pescador et al., 2005) while HIF1A is only accumulated under hypoxia. Therefore only a knockout of HIF1A was considered a possible candidate for an AND gate. The second or third possibility would be a knockout of either TDAG8 or VEGFR-2. Both can be described by the same model as both receptors are activated by one input and trigger activation of the associated promoter afterwards. Unfortunately, experimental data only exist for HEK cells which are not representative for T cells (Ausländer et al., 2014; Nguyen et al., 2012). Therefore, the different AND gate designs were modeled with the same rate constants to compare their performances (equations in following drop down menus, Fig. 2, 3). kbasal describes the basal expression rate, kmax the maximum expression rate, kdeg the degradation rate, Km gives the concentration of the activator were the promoters half activity is reached and the Hill coefficient n the activational slope of the given promoter. kdim and kdis are always describing the dimerization and dissociation rate of HIF1AB.